I know, I know. Here I am, posting a green smoothie. Me, the girl that berated juice cleanses and liquid diets in lieu of hot fudge sauce. But, you know what, sometimes after a week of decadence and doughnuts and tacos and fried everything, we were craving something fresh for lunch instead of our usual melted cheese something or other. 1. Stick to yellow, orange, and green fruit if you actually want a green smoothie, and not some sludge the color of a mud puddle. Seriously, step away from the strawberries. 3. Add ginger. Always ginger. The end. I kind of threw this one together, and Taylor totally turned up his nose when I poured it in his glass. But despite the verdant hue, you’d be hard pressed to taste the vegetation. It’s refreshing from the cucumber, sweet from the mango, and spicy from the fresh ginger. We added a full 2 tablespoons (you know I like it spicy), but feel free to dial it back if you’d like. Just, please, don’t leave out the ginger. 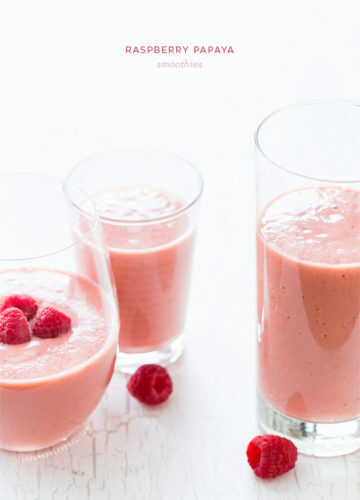 It’s what makes this smoothie sing. I totally get bonus points for creating a smoothie the perfect shade of green to match my blog design, right? Right? Don’t worry, we’ll be back to fudge sauce next week. Gorgeous! Ginger is a must for me, too. And mango with greens is always a great balancer. And cucumber, too. Wow, I want this right now! Stunning images, too! I absolutely love my green smooties with mango that’s all I drink in the mornings. I love a good green smoothie, I am definitely adding ginger next time. Also – stay away from blueberries – thats a color combo no one wants to drink. This. looks. amazing! I love ginger! And I also love that you only use natural sugars in your recipe. Nice! 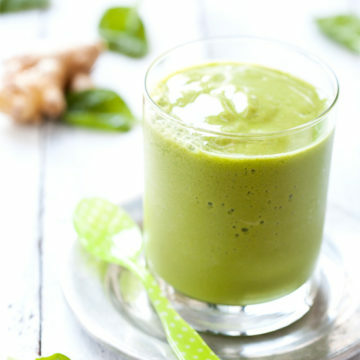 I make green smoothies all the time with spinach and mango but never thought to add ginger. Definitely need to try that next time. I’m thrilled that i have all of these ingredients on hand. Love the colour and can’t wait to try it! we all need a healthy kick once an awhile! I LOVE GINGER so I want to try this. You’re the smoothie expert here so: Can I sub in pineapple (or banana – or is that weird) for mango? I’m allergic to mango. Yummy! Ginger is my favorite thing ever! I’ve been hoarding a container of candied ginger in my fridge for like a year now, probably because I needed 1/2 ounce for a recipe and JUST REALIZED I could just, you know, eat it. OMG – I about died! I love the color and didn’t think ginger would add the extra zing! Need to try it now. The color is so fresh; I can hardly wait to go home and make it! Sounds like a luscious drink with all my favorite flavors wrapped into one! Thanks for sharing. Now, don’t we all need this once in a while. Adding ginger at the end, perfect! I love green smoothies, in fact I had one for breakfast this morning. I love the sound of yours with ginger and cucumber. I will be sure to try this. Lovely! And I love the addition of ginger – mmmm! Yum! I will add this to my to-try list when I start having an abundance of veggies from my CSA, hehe. So healthy! This looks awesome! sounds perfect and so pretty! Sometimes a little green juice is exactly what you need… after a week of donuts and fried food… it really does the trick! It’s ok, I won’t judge! Oh I need this after my time in Austin….it was like a week of doughnuts…! 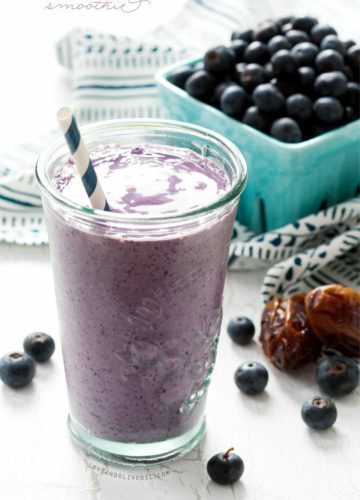 I make almost this exact smoothie nearly every day for breakfast, only I add lemon (cuts the bitterness of the greens and compliments the ginger very well), and berries because they are good for you blah blah blah (cue sludge color). I’m going to try swapping out the fruit for a better and more appetizing color. Thanks for the tip! This looks so refreshing, Linds! I have been on a huge green juice kick lately … especially after gaining 49.8 pounds in Austin. Pinning! I love it … and you right the green is perfect combo to the blog design. This looks delicious and very refreshing! I made my first green smoothie over the weekend and loved it! Didn’t have any plain yogurt at the time, so used almond milk, spinach, ginger, fresh mint, half an avocado for creaminess, a scoop of protein powder, and a few ice cubes. I was astonished at the fresh taste from the ginger and the mint. Can’t wait to try your version with the cuke and mango. I’m a convert! Sounds pretty delicious to me! I’ve had some green smoothies (well, really just wheat grass) mistakes in the past, that were plain revolting–but I love adding spinach and mild greens to smoothies as well (and carrots!). This drink looks so refreshing and healthy! Perfect for the summer months. 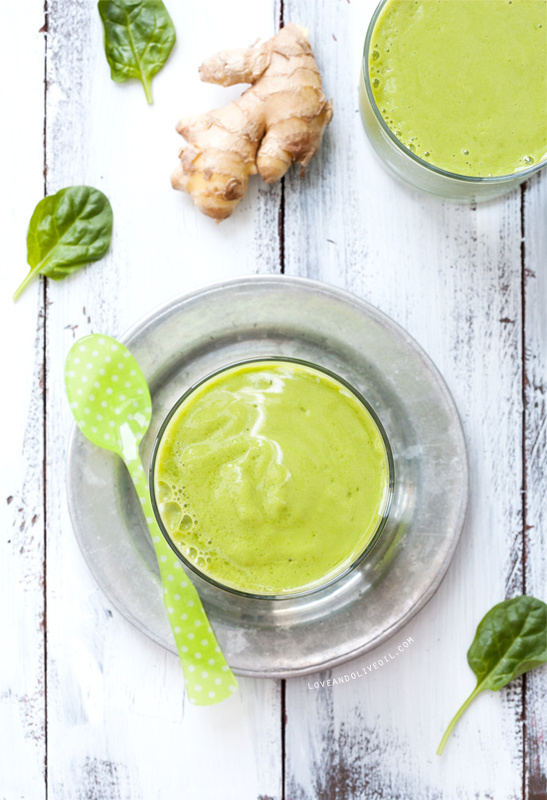 I love ginger in my smoothies, it is so refreshing :) this looks wonderful! I definitly tried it and it’s so delicious.Added frozen peaches,it was refreshing,i have enough for one more tomorrow!! I don”t like green smoothies, but this sounds good and I’m going to get more healthy in 2014, so I will try this one. thank you! 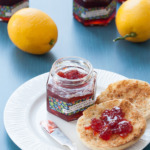 Great simple recipe and delicious! I just wanted to say thank you for this. I treated myself to a Vitamix, and have been looking for great recipes to make in it that would be nutritious and help us get more greens in our diet, and this did just that. So fabulous! I was a little surprised you (and others) would forgo some of the wonderful nutrition to be found in berries or whatnot, just ’cause they’d throw off the color. While a bright green smoothie is often nice, I’m willing to go for sludge-y-colored ones, too, as long as they’re tasty and full of fresh goodness. In our diets that are so often lacking in variety, I find smoothies a great way to really mix it up. (Sorry for the awful pun … .) Not trying to be judge-y, ma’am; just sayin’. Good recipe, and thanks for sharing. This has become one of my favorites! I make it at least twice a week. Hooray! :) So happy to hear! I just made this smoothie for dinner! I had to leave a comment, that this was delicious! I appreciated the color tip. and these basics made such a clean tasting smoothie! I add fennel chia seeds to my smoothies, it helps me to feel fuller longer. Like I read the other day; crazy is not to have a plant based diet, crazy is to have open heart surgery. I loved the notation regarding mustard greens. Had a similar experience with collards when I lived in Texas. I’ll definitely start adding fresh ginger now to my own smoothies, great tip and fun article. This sounds incredibly healthy and very tasty. 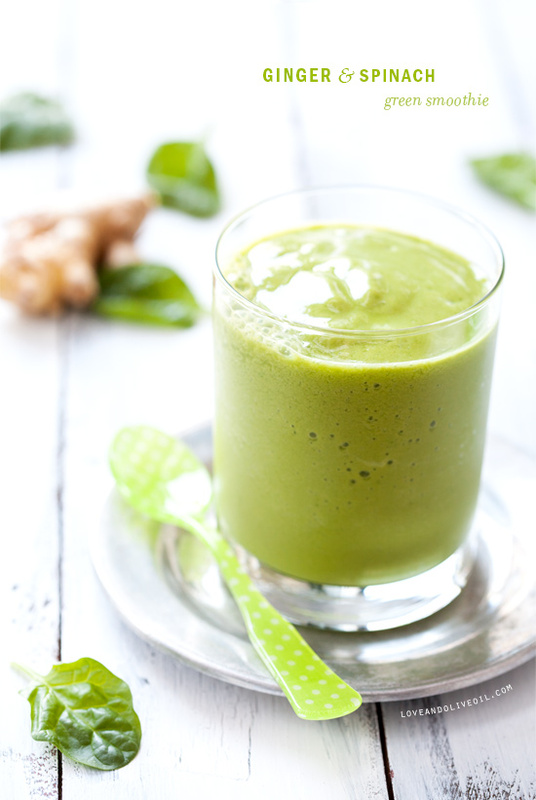 So many green smoothie recipes are kind of bland but the addition of ginger really perks up the taste. 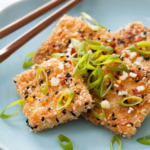 Love this recipe, tasty and healthy.